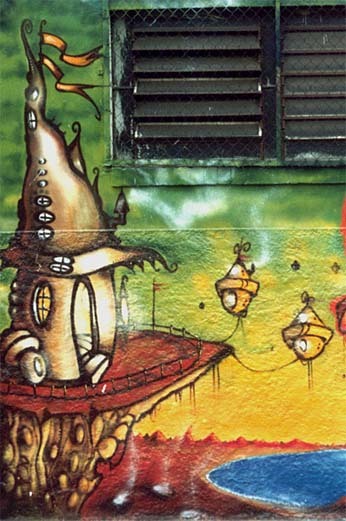 Article and images © copyright 2000, Os Gemeos fiz@uol.com.br and Art Crimes. 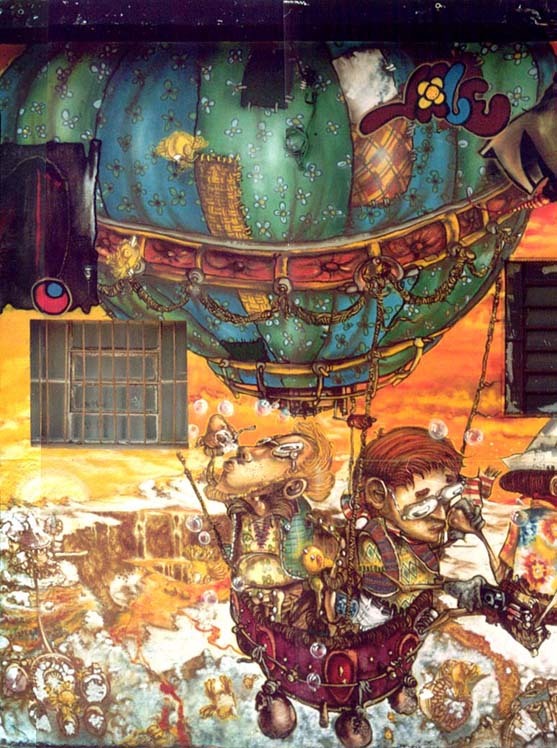 Os Gemeos means "the twins" in Portuguese and is pronouced "Ose Zhe'-mee-ose." 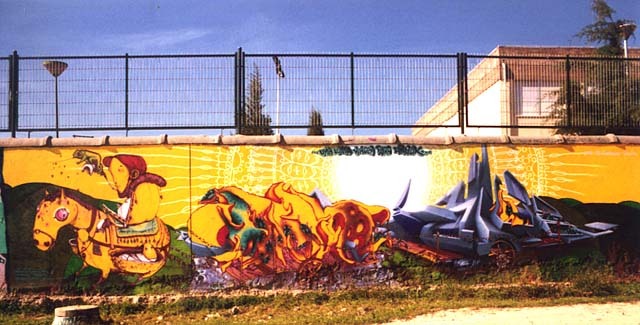 These two prolific writers have caused quite a sensation since they were featured in 12 Ounce Prophet in 1999, but they've been doing their thing in São Paulo Brazil for quite a while, as some of you lucky enough to see photos from there already know. We met The Twins in Portugal late in 1999, while they were on European holiday. 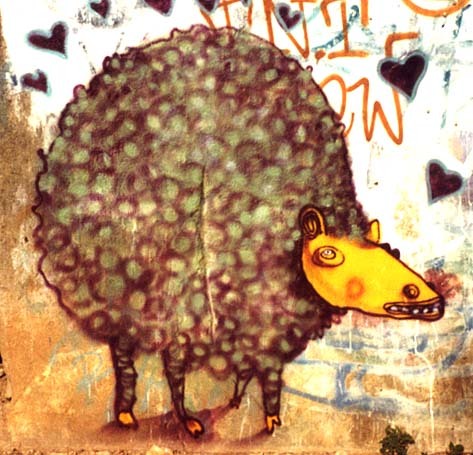 Check out the painting they did with Daim in Carcavelos, a very silly sheep and a funny bird (between 2Fast and Lunar from Zagreb). 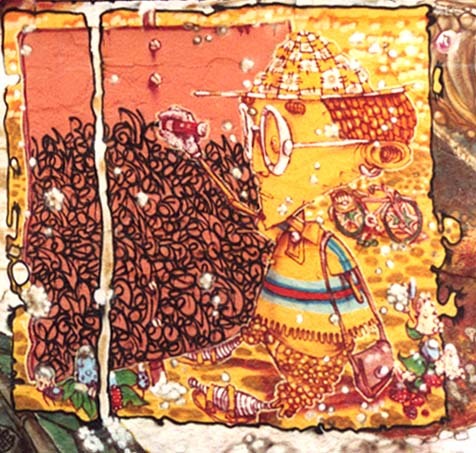 Here's a production done by Os Gemeos and Vitché, in 1999. 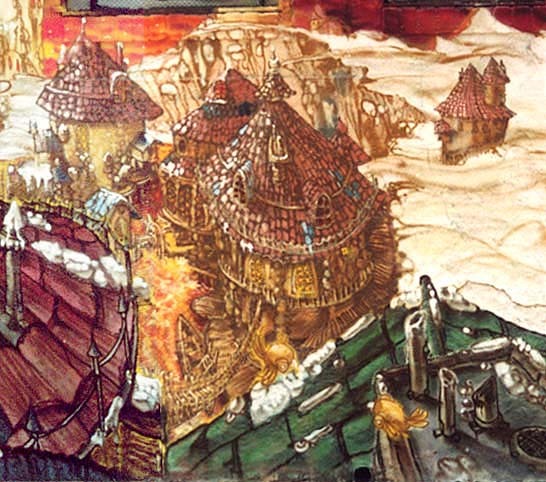 Clicking the images above shows the images at screen size, but to see all the details, you might want to look at the bigger images linked below. If those files are too big for you, we have some detail shots farther down this page, including readable images of the text on the doors at the bottom of this page. AC: Let's start off with some basic information... OG: We are 26 years old, from São Paulo, Brazil. 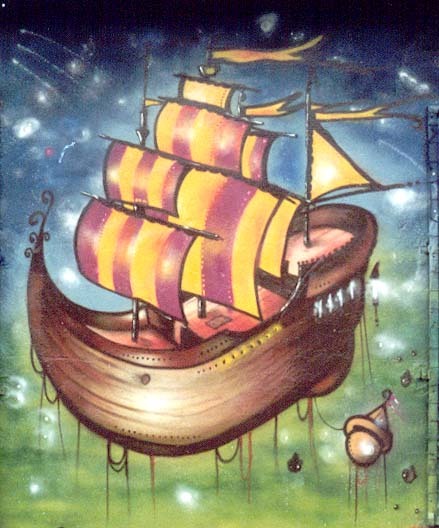 We started to paint in 1987. We do a magazine, called Fiz, that reflects the graffiti and many other art forms from all the South American cities, and we plan to do a web site next. AC: Because you are twins, you guys probably paint together differently than other people do. How would you describe your collaboration? Is one of you the letter guy and the other the character dude, or what? Are you really telepathic? OG: We are both part of one World: our world. We paint together always  the characters, background and letters. Sometimes, on some works we divide the piece so that one completes what the other one starts. 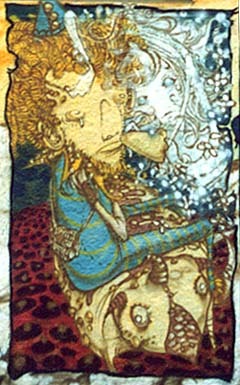 We remember things and all of those things are materializing. Telepathy ... we think maybe sometimes the silence says more. 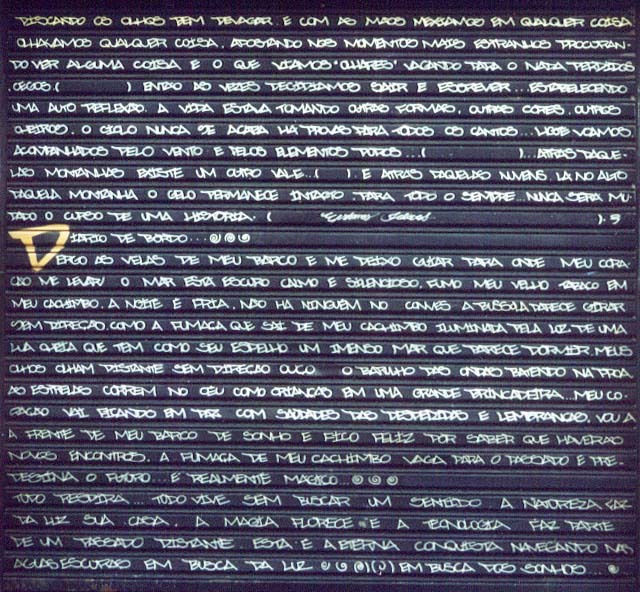 AC: Brazil has been apart from the main graffiti movement in some ways. Why? When did the outside world break in, and how? OG: We knew hip hop culture in 1985. We live in a district where hip hop culture was very strong in its beginning. We went to the street and saw our neighbors break dancing on the sidewalk. All night they practiced and we fell in love with this universe. 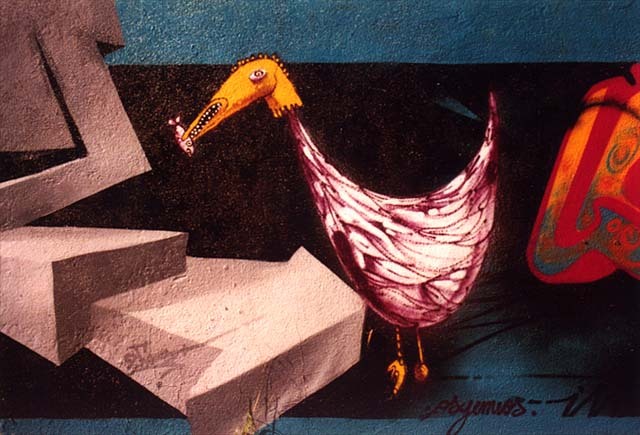 AC: Some unique styles have developed in Brazil as a result of its relative isolation from the rest of graffiti culture. What are the big stylistic and tools differences? OG: At first we were the same as the others, painting b-boys and generally staying close to the themes in hip hop culture. As time passed, naturally things changed. We never forgot the roots, but we decided to go our own way. As for techniques, here in São Paulo things are different. We decided to use different materials (for example, latex) not only because it is more economical, but because it's more available, it covers so well, and because it supports what we find in the streets. We always use latex for backgrounds and then outline in spray. Yellow latex and red spraypaint are used just for bombing. For the big panels, we use only spray paint. We think that latex goes with our culture. 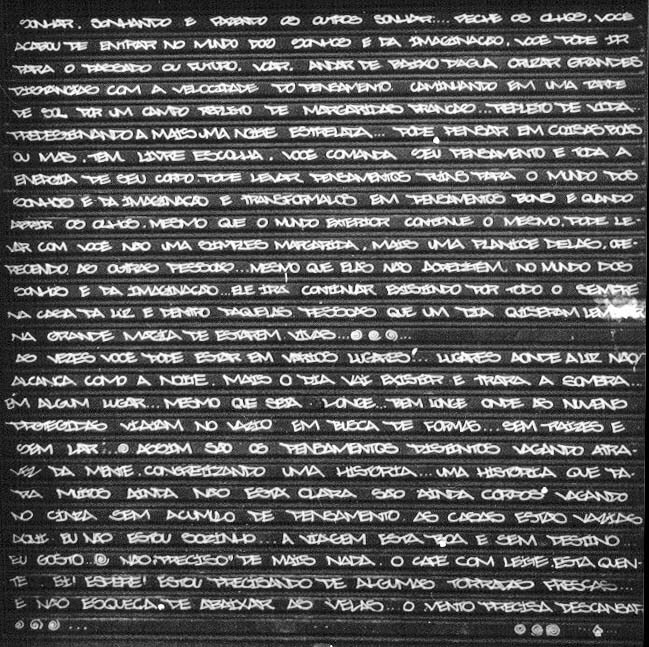 Perhaps because we had no information about graffiti in the beginning, it helped us a lot. We never watched anyone else painting. The only things that we had were some flicks and a piece of film that showed us graffiti. So we tried to discover how these things were done. We think we ended up discovering other things as a result. English translations of the panels. 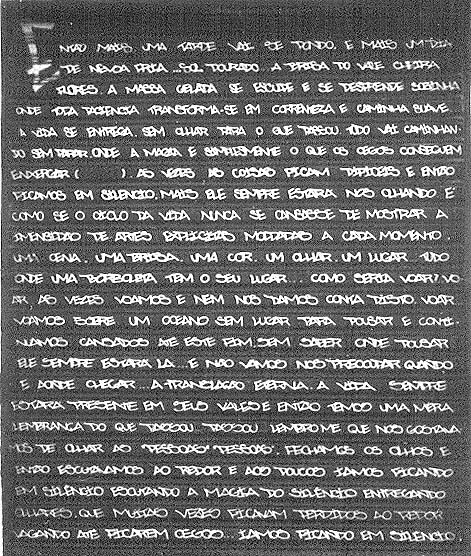 Thanks to Armis2 armis2@osite.com.br who translated them from the original Portuguese you see below.